1. Create an account on SearchIQ. 2. Copy the API key from SearchIQ account, you can find it after selecting “Add domain” option. 3. Once you’ve created an account, go to your WordPress site and install SearchIQ WordPress plugin. 4. You will be asked to enter your SearchIQ API key. 5. Select the post types you want to search. 6. Index your posts and you are all set! For content you want users to search on your site, we first need to index it. 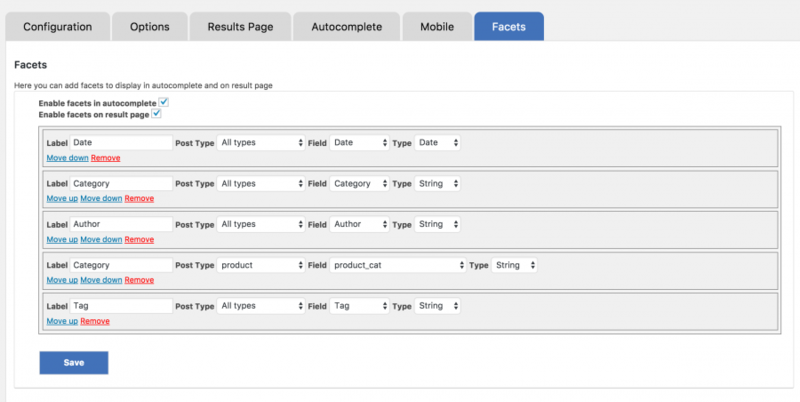 SearchIQ allows you to index different post types along with its corresponding custom fields and taxonomy. With the interface below, you can decide what post types to index, what custom fields you want to filter out, what image in the post you want to use it as thumbnail. SearchIQ only indexes Published posts and we allow you to filter out some posts using post IDs and url patterns. SearchIQ can index pdf content with a maximum size up to 10 MB each. If your pdf is associated with the post as attachment post type, it will be indexed in our end transparently. To improve the index accuracy, it is better if you make your pdf accessible (ie. provide us metadata like title, author, tags in the pdf). To do that, you can follow the video below. If you have SearchIQ set up properly, you should be able to see our autocomplete and search result page as below. If you don’t have search bar or autocomplete is not showing up in your search bar when you type, you can follow the “Setup Your Search Bar” section of this Guide to fix it. For autocomplete, we will show title, description, and thumbnail by default. If you are using our cross-domain feature, you will see the domain name as well. For details about cross-domain search, you can consult our “Cross Domain Search” Section below. Along with search result, there is a thumbnail. For the Free account, SearchIQ will generate thumbnails in your server and serve from there. For our paid users, thumbnails are generated and hosted on SearchIQ servers and deliver through CDN for better performance and user experience. In term of search relevancy, by default, SearchIQ will use Board Match. That is one of the match options that try to boost up the search coverage by identifying content that has some terms matching the query regardless the word order and form. If you want the match to be more restrictive, you can try other matching options like “Full-term match” and “Phrase match”. There are times you want to have a better control on the result ranking. For example, you want our search engine to give higher priority to the posts that have a title match than that of description match. To address this need, SearchIQ provides you a field weight control page under “Documents” menu tab that you can go there to adjust the weight at the field level with 10 the highest weight and 0 if you want to ignore. 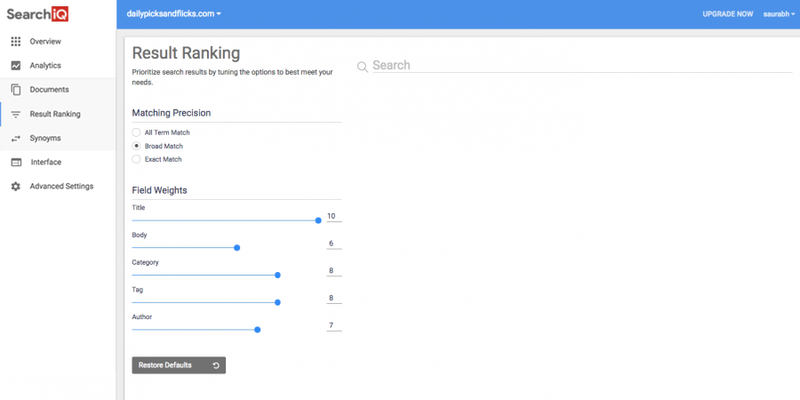 SearchIQ will provide custom sorting feature shortly. With this feature, you can do the multi-field sorting. For example, if you want the matching content ranked by popularity first and recency next, you can do it in our UI given the popularity field and post date are indexed. SearchIQ tracks what your user’s searches and clicks on your site and provides you analytic reports. To access your domain reports, login into SearchIQ admin area, select your domain and click the Analytics on the left sidebar. 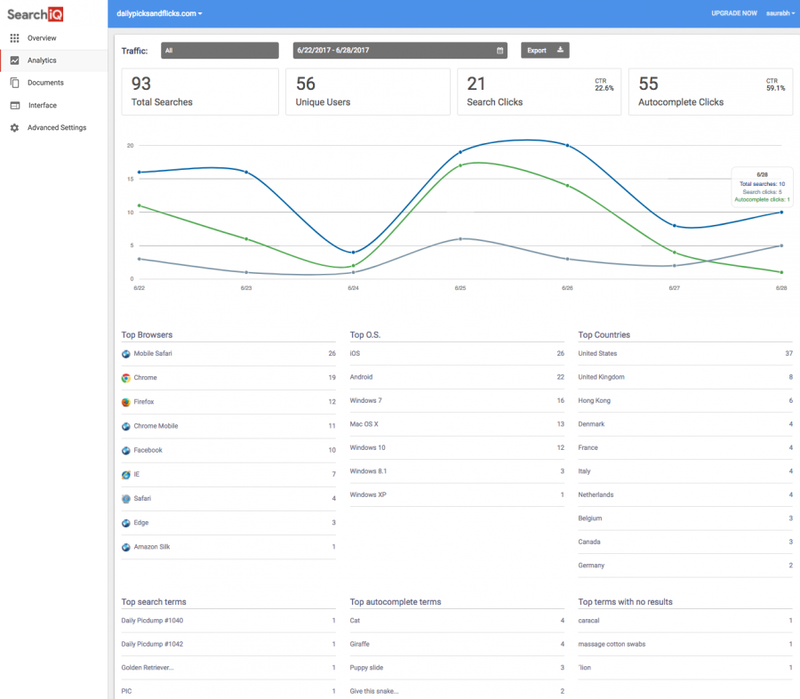 In the analytic dashboard, you can see # of searches, # of autocomplete click and # of result page click for your users within a time range you selected. For the Free account, you can examine the data for the last 24 hours. For larger time range, please consider upgrading your account. SearchIQ provides both mobile and desktop analytics. You can select view them as a whole under “Traffic: All” or individually. The reports that our users use the most are “Top Search Terms” and “Top Terms with no result” sections. For the “Top Searches Terms” section, you can find out what kinds of content your users expecting from your site. So, can follow the demand to deliver the content your users are interested in. 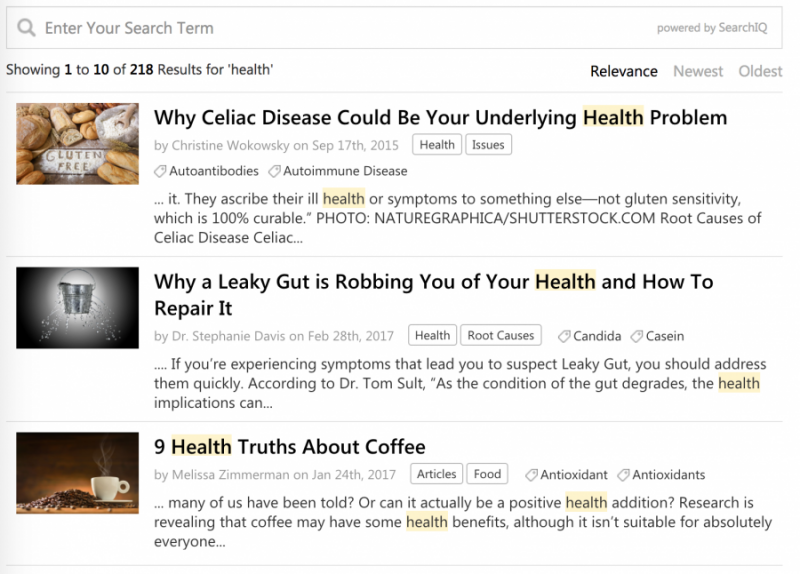 For “Top terms with no results” section, you can see if you are really missing out some opportunities there or some search terms do not appear in your content but you have written about it. For latter, you can use our “Synonym” section to fix it. 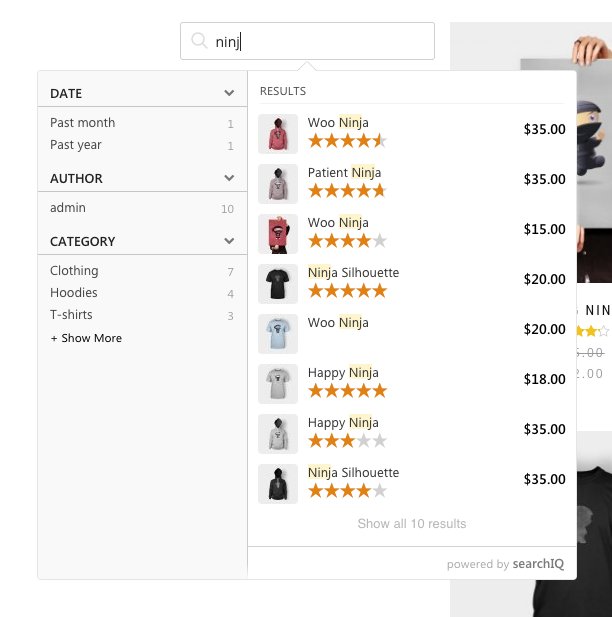 For example, if user search on apparel with brand “A&F” but your product title and description only use the full name “Abercrombie”, it may not come up as a match. If you see “A&F” in your “Top terms with no results” section, you can go to Documents > Synonym Section and add the synonym “Abercrombie, A&F”. This way you are teaching our search engine that they are the same in meaning so next time when a user types A&F in the search query, Abercrombie products will be shown up in the search result. SearchIQ can help you to add this search feature on your site with ease. You can take the following steps to add a facet to your search bar. Then a row with 4 fields will appear. First, you need to give the name on “Label” field. Next, you will decide what post type you want to add a facet. If your facet is common fields like author, category, date, and tag, you can leave the drop-down unchanged. If your facet is just applicable to product post type, you can select “product” from the post type list. After a post type is selected, the “Field” drop-down will be populated that just list you all the custom and taxonomy fields associated with the post type you selected. Select the field and give it a type then you are good to go. You can have 5 facets for a post type. From the above screenshot, 4 facets are defined for all post types and I have the facet feature turned on for both autocomplete and search result page. Below you will see the facet shown up over post search. 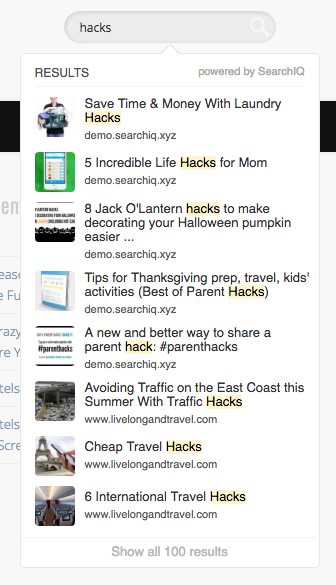 NOTE: SearchIQ facet feature is still in beta. If you face any problem when you try to use it or you have some suggestions to make it better, please drop us an email. 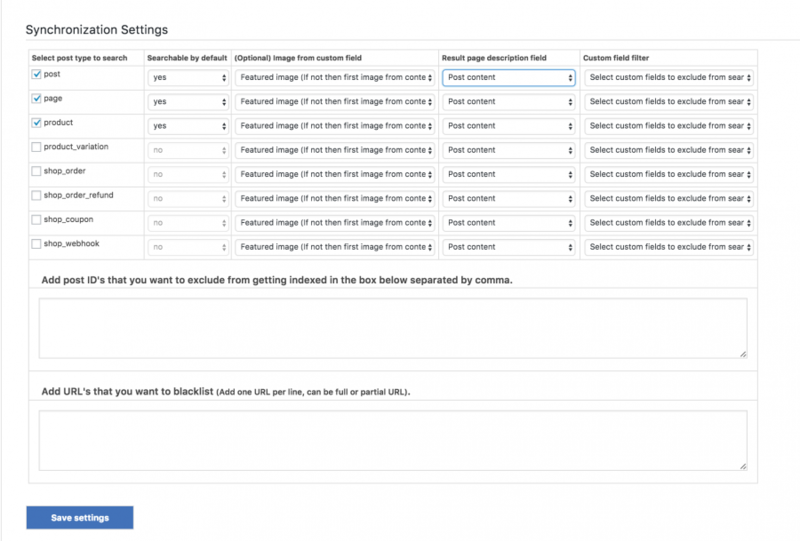 Select the widget option under appearance in your WordPress dashboard. 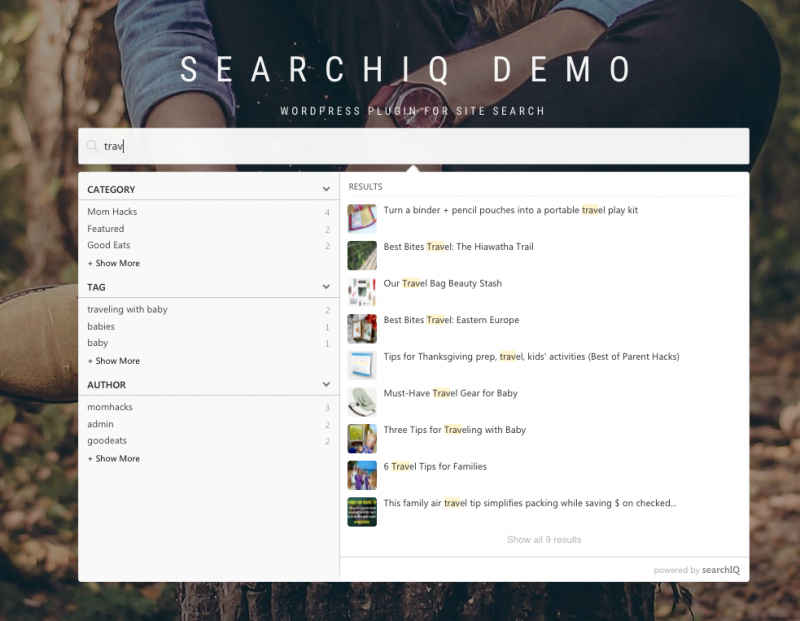 Grab the “SearchIQ search box” from the widgets menu. 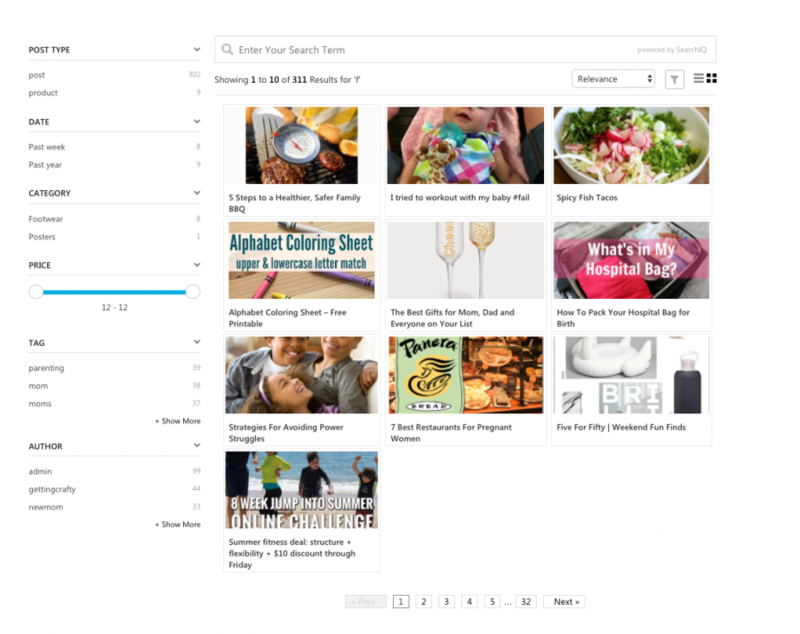 Drag and drop it wherever you want it on your site like a sidebar. Note: In this widget, you can select which post type(s) you want your search bar show. With this capability, you can create a search bar just for your post, product or other entities. Select the menu where you would like the icon to be (header, footer, main, etc.). Finally, select save. The icon will show automatically at the end of the menu you have chosen. Add the following shortcode anywhere on the page, post, custom post type or widget. type – Accepted values: “search-bar” or “icon”. “search-bar” will show regular text box for search. “icon” will show a clickable search icon for search. Clicking the icon will open a search-bar. post-type: any built-in or custom post type that you have indexed. By default, it includes all post types you index. width: it can accept any integer value which will be used to set the width of the search box. The integer value may be suffixed by % or px. If the value is added without suffix it will by default take px as the suffix. Default width is 100% of the parent element and for icon it is 300px. 1. 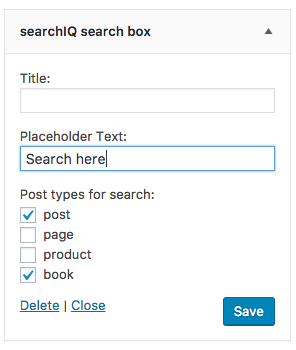 Go to SearchIQ WordPress plugin. 3. Customize the fields as per your requirements. 4. If there is no customization for any specific element you are looking for, please watch the video above. 2. Select Results Page tab. 3. Add CSS rules to override in Custom CSS text area. 4. Click Save. Its done!